Ever wander through one of those beautiful boutique home decorating stores just before the Christmas season? If you have, you know these stores are often filled with tasteful, unique and sometimes breathtakingly beautiful holiday ideas. Just exactly where do these store owners get these original home decorating ideas? The answer to this burning question is that they get them at a variety of extravagant trade shows around the country. Let’s take a look at just what the source is for all this holiday decorating bliss. According to “Selling Christmas Decorations Magazine”, the major shows that US buyers report as their most important sources of holiday decorating ideas are The Atlanta International Gift and Home Furnishings Market, The Dallas Total Home & Gift Market/Holiday & Home Expo, The New York International Gift Fair, and The Chicago Market: Living & Giving. The Atlanta show is attended by buyers of furnishings and home décor, as well as gift shop owners, interior decorators and those who sell gourmet food and elegant tableware for the holidays. A big influence in the industry, this show is for the trade only, so if you want to know the latest you’ll have to hook up with a local decorator who makes attendance at this show a priority. Billed as the most complete wholesale market in the country, the Dallas Total Home & Gift Market this June featured 222 exhibitors in the Christmas category alone. In the category of Christmas lights, a real original is 12 Gauge Designs. 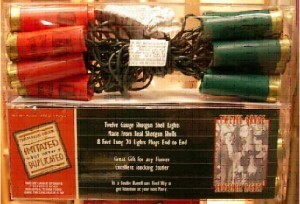 In true Texas style, this off-the-wall manufacturer offered Christmas lights in the shape of 12 gauge shotgun shells. Don’t let anyone ever tell you Texas doesn’t have an attitude all its own! Not to be outdone the New York International Gift Fair packs 2900 exhibitors into the Javitts Exhibition Hall and the Pier 94 passenger ship terminal. Here you’ll find a mind boggling selection of merchandise for the home and holidays. Each August 30,000 buyers from 50 states and 77 countries descend on the city to collect the gather holiday decorating merchandise from the 4 corners of the world. When it comes to lights decorations, this show, as well as The Chicago Market, have plenty of ideas to satisfy even the most selective designer.